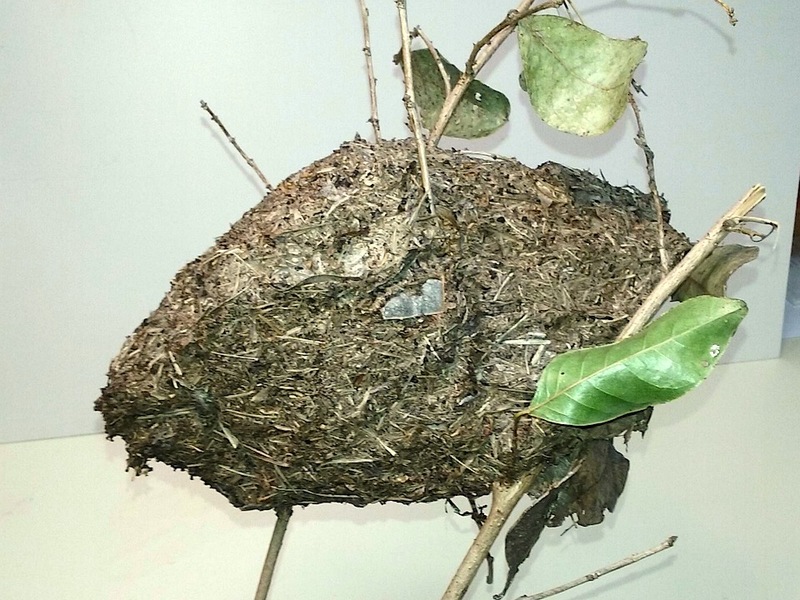 A guest post by Dr Mike Downes; his first, about a different species of black weaver ants, is here. Jumping spiders are undeniably cute, even to people who ‘don’t like spiders’. They display a fearless, active curiosity about the world around them out of all proportion to their diminutive stature, and they have those big eyes which somehow prompt a gush of affection even across the huge gulf between two-metre anthropod (1) and five-millimetre arthropod. They are also common enough in our gardens and houses to be observed often, are enormously varied (500+ species) and display a wide range of hunting habits. Some of them (getting to the point of this post at last) mimic ants. 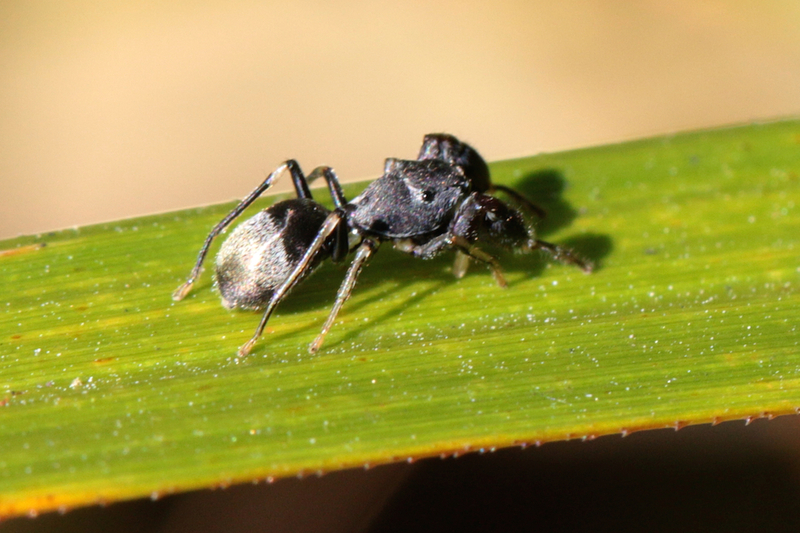 This ant, one of many I saw on the strappy leaves of a clump of what may have been flax lilies in the Wallaman Falls camping ground, is very similar to the common Polyrhachis ammon but is a bit smaller at 4-5mm. I am reliably informed that it is closely related even though we can’t be sure of its exact identity; we will have to call it just Polyrhachis. When I saw this spider I thought, as I was intended to, that it was another of the ants. It was the same size and coloration … but its movements weren’t quite right: spiders dart and pause, while ants tend to keep moving. Its head looked too big, too. 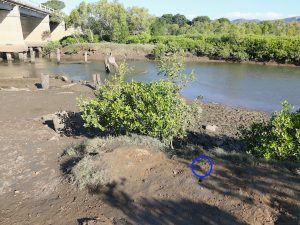 When I disturbed it, it stretched out its front legs which had been tucked up beside its head and it suddenly was clearly a spider (eight legs, no antennae), not an ant (six legs plus antennae). Clearly a jumping spider: Ligonipes sp. The aggressive nature of ants, and their possession of noxious chemicals, stings and strong mandibles make them unfavourable prey for many animals. The resemblance of a similar-sized arthropod to an ant can therefore also protect the mimic from predation. 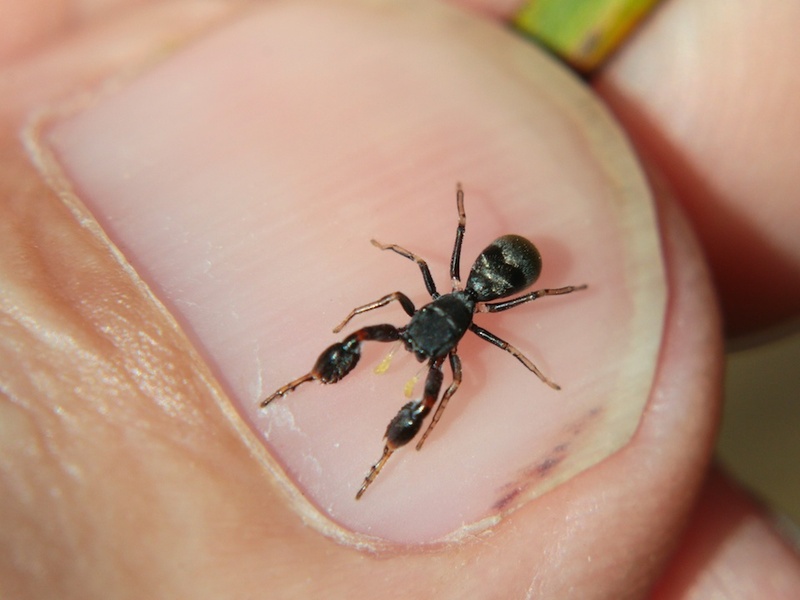 Myrmarachne is an ant-mimicking salticid spider genus, whose species associate closely with their model ant species. The behavioural reactions of Myrmarachne to ants were analysed, including instances when there was contact between the spider and the ant. In Townsville the salticid Cosmophasis bitaeniata and one Myrmarachne species associate with Oecophylla smaragdina workers. The Myrmarachne mimics the ant visually, and Cosmophasis bitaeniata mimics the cuticular hydrocarbons of the O. smaragdina worker ants. 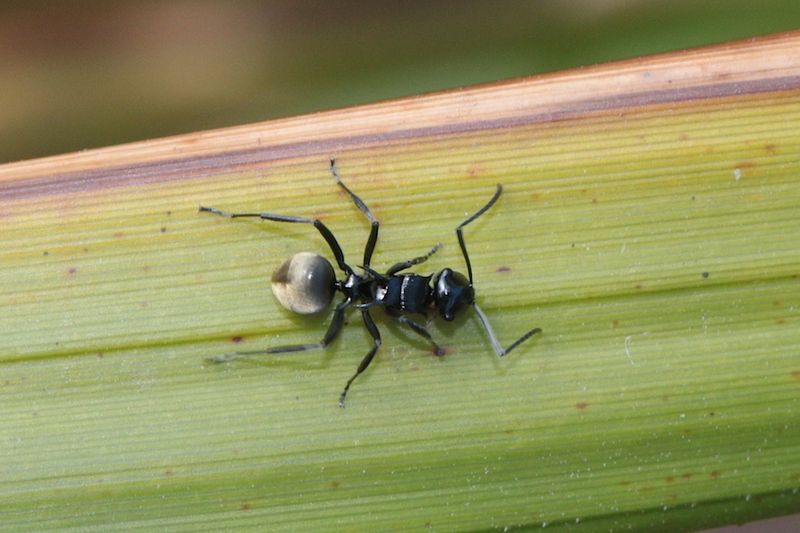 Cosmophasis and Myrmarachne also mimic ants through certain types of behaviour, such as the “antennal illusion” and bobbing the opisthosoma up and down. Mine is not a Myrmarachne but a Ligonipes, one of the other four genera of ant-mimicking jumping spiders occurring in Australia according to Ed Nieuwenhuys (the others being Judalana, Rhombonotus and Damoetas) but the same arguments must apply.